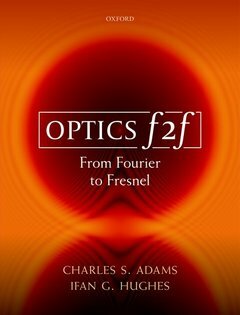 Optics f2f Adams Charles S., Hughes Ifan G.
Auteurs : Adams Charles S., Hughes Ifan G.
This textbook on optics provides an introduction to key concepts of wave optics and light propagation. It uniquely makes extensive use of Fourier methods and the angular-spectrum approach, especially to provide a unified approach to Fraunhofer and Fresnel diffraction. A recurring theme is that simple building blocks such as plane and spherical waves can be summed to construct useful solutions. The text pays particular attention to analysing topics in contemporary optics such as propagation, dispersion, laser beams and wave guides, apodisation, tightly-focused vector fields, unconventional polarization states, and light-matter interactions. Throughout the text, the principles are applied through worked examples, and the book is copiously illustrated with more than 240 figures. The 200 end-of-chapter exercises offer further opportunities for testing the reader's understanding. Charles S. Adams is a professor in the Department of Physics at Durham University. He obtained his PhD at the University of Strathclyde and did his postdoctoral research at Konstanz and Stanford Universities. He has been at Durham since 1995. Adams is the winner of the IOP 2014 Thomson Medal and Prize. Ifan G. Hughes is a professor in the Department of Physics at Durham University. He obtained his DPhil at Oxford University, and did his postdoctoral research at Oxford, Yale and Sussex Universities. He has been at Durham since 1999. Hughes is the coauthor of Measurements and Their Uncertainties (Oxford University Press, 2010).